mmeiser blog: Core Values - Are Blog Comments More Vital Than Posts!? Core Values - Are Blog Comments More Vital Than Posts!? Blog comments are more vital than posts. Comments make a site interactively dynamic, rather than non-participatorily static. A blog post just starts the conversation. Blog posts are a dime a dozen. not the post. Post as star is narcissistic. Without comments, most posts are dead-ends. It's an excellent post, well written and there is much more, but I could not post it all. However. I DISAGREE. I'm posting my response here on my blog, and it should be apparent as you read it why. Comments are good for the spirit and soul. But what about reblogging!? Reblogging is what blogging lives on. Not comments! Without re-blogging blogging would wither up and die. Reblogging is good for the spirit and the soul AND it feeds the conversation in a way comments cannot. It not only feeds the "google juice", but it makes us the bloggers the conduit through which we find things of importance. Reblogging makes our friends and other bloggers the conduit through which we learn. I'll take one reblogger over 1000 comments. I can live without comments. Can you live without rebloggers? If no one blogged about you who would know you existed? Where would your readers come from? You would be a one handed tree clapping in the forrest! A sheep in a wolf's suit! When we blog we make media but when we reblog we become the media. It's through reblogging that we know what blogs are good, what posts are good, what's news is interesting. Every step of the way the color commentary is added. The sparks and fizzle, the spice of life. Important points are honed, validation given, credibility is found, useless drivel falls away, all that is left in the revlogging process is truth, brutal truth, agreement by fire. And politicians fall from grace, and news anchors resign. Not because of the first post or the first word, but because of the rallying on, the groundswell, the uproar which comes there after. It's not that the first word was true. It's that the millions of bloggers there after found it and found it true and then reblogged it. It's because of reblogging that I keep up on the important aspects of the blogosphere. If a pin drops on the far side of the world and it pertains to me I will find out about it because it's more likely that one of my trusted sources of like interest will blog about it than a newspaper will write about it. The blogs I read become my conduit. Bloggy media is the future because only the collective we has the capacity to cover all the news that matters to us. No committee can, no political system, no media, no other system known to man has this power. A newspaper will not write about this post or you or me but these words are important, vital even to we who write them, if not many others. But while a newspaper may not write about this, it is quite possible it may not fall on deaf ears and many will, and so the ideas, the passion and the truth in these words may travel outward virally. Through reblogging the capacity of this medium is directly proportional to the amount of readers and the amount of rebloggers. Comments are merely the niceties, the frosting. Reblogging is the business end, the mortar, the cake. Reblogging is what makes blogging golden. It ignores the unfit, the unwelcome, the uninteresting, the uncontroversial and it embraces the bold, the thoughtful, the artful and the beautiful and it rallies them on. That which is of no consequence falls on deaf ears and that is where it dies. That of interest finds its keepers in exactly those souls who find it interesting and worthy, and hence they reblog it, and on the story goes in exquisite form. Growing, adapting, evolving, finding new minds and fresh eyes. Twisting, turning. While it would appear to have a mind and life of it's own a soul even it is dead. Reblogging is an exquisite corpse at the same time it would appear to be alive without the hearts and minds of rebloggers it would be dead. It is only through re-blogging does the conversation lives on. And so it goes with this post. Though it's focused on aspects of reVlogging not reBlogging it pertains directly to this post. The issue of reblogging is 100x's renewed in podcasting and video blogging. As it is a first draft, it is sucky and narcissistic just like you'd expect it to be not serving but its own master. But it's full of pop and ooze and goo and stuff and it's on a wiki. So, please come help me fix it or send me an email, or comment in the "talk" function or reblog it, or quote it, or disagree with it tear it apart where it stands. That's what it's there for. It has nice creative common license on it or it should. It's for all to hammer upon and borrow from and rewrite. And just as long as credit is given where credit is do I don't care. You are right Michael, first Steven forgot, then we commenters forgot, and then you came and reblogged and commentend on the forgotten essential, the Reblog ! I agree, thats the strength of Blogging, the reblog makes everything stronger- the post and the comments and spreads it. But what is, if a Reblogger makes the original Post weaker ? Often one reads the Reblog, without going to the Blog too. (1.) 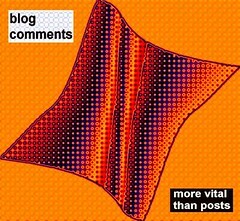 Reblogging, quoting or writing about a post at another blog, and linking to it, can be a detrimental activity, as Grijsz points out, could distort or prevent readers from reading the original post, due to negative critique of it in the "reblog". Readers then react to your "paraphrase" or partial quote. (2.) Reblogging can deteriorate into a clinking scenario. "clinking" = clique/cult linking, favoritism, closed circle society of bloggers drooling all over each other, flirting, and kissing each other's butts. (3.) Reblogging is vital for journalist blogs and political blogs, as we see Instapundit do. But is it vital for business blogs, or even for personal diary type blogs? (4.) A marcom blog seeks to display the consultant or company's expertise, and to build an online community of loyal readers, among whom some convert to clients or customers. Reblogging can assist this goal realization to some slight extent perhaps, but it's the voluntary interaction represented by reader comments (plus email conversations) that are the source of community. (5.) A blog that had a lot of references in posts to other blogs, and received the same reciprocally, would still not be as interesting and dynamic as a blog that is enriched by valuable, funny, insightful comments.